Sound "Resolution, resolution, and resolution" -- "if there was a sound to be reproduced, it was reproduced quickly and cleanly (emphasize cleanly) along with everything around it"; but "there was nary a hint of zippiness that I find can be a problem among more detailed speakers"; "impressively clear and precise imaging" along with "more punch to these little guys than I ever would have guessed." Features First-order design utilizing Thiel's own drivers; 2"-thick front baffle; magnetically shielded. Use "One important constraint due to the phase and time alignment of the drivers is that the listener must be at least eight feet from the speakers to derive the full benefit of the design"; Tim also found that " the bass did become a little boomy if [he] encroached on the three-foot distance to the front wall." Value "For all the performance they deliver, they must be considered a relative bargain at their $2390 asking price." Most audiophiles can easily recall the experiences they had that drew them into this often insane but also insanely gratifying avocation of ours. Although I have been following the audio scene at some level for the past 20 years or so (yikes! ), one of the catalysts that ultimately drew me back in hook, line, and sinker occurred somewhere in the mid-1990s when I happened into a high-end dealership and heard Thiel CS1.5 speakers. What appeared before me through these relatively small floorstanding transducers was a more incredibly realistic and three-dimensional portrayal of a recorded musical performance than I had ever heard before. It was as if the stereo equipment had melted away and I was being treated to a private concert, and I will never forget the utter amazement and deep emotional response I felt at that single point in time. Not only was I hooked, I swallowed the sucker! If I were a fish, I would have been reeled in, cleaned, and on the plate. So when Marc Mickelson e-mailed that he wanted me to review the new Thiel CS1.6 speakers, I was more than a little interested. I had seen pictures of the new model that had evolved from the CS1.5s that affected me so deeply, and it was clear that Thiel did some serious work on the next-generation CS1.6. But whenever a special product (or at least what was a special product as it existed in my memory) is so thoroughly reworked, the fear exists that at least some of the magic of the original might get lost in the process. It is also a bit unsettling to go into a review with such lofty expectations, as reliving the past almost always pales relative to our selective memories of the original event. But upon first listen to the CS1.6, I knew that high expectations were indeed warranted. 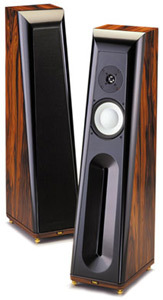 Like the CS1.5s before them, the CS1.6es ($2390 USD per pair) are relatively small, two-way floorstanders. They measure 35.5"H x 9"W x 11.5"D and weigh 38 pounds each. The review pair was finished in white oak, which was attractive and flawless with the exception of a small, one-inch split along the rear corner of one speaker that corresponded to a good-sized dent in the box the speaker came in. Chalk this one up to shipping demons. The front baffle of the CS1.6 is a low-gloss black in color and 2" thick, while the rest of the cabinetry sports 1" walls. Rapping on the front baffle produced very little but sore knuckles, and the side walls emitted a rather dead "thunk" that, while not signifying the most inert-sounding cabinetry, did not have me overly concerned about hearing singing wood along with my music. One of the coolest features was the grille, which fits neatly into a slight indentation in the speakers front baffle and fastens magnetically, preempting the need for pegs and holes. Very slick. As cool as the grilles were, though, I preferred listening with them off as I found them to choke off the last bit of air and detail up top, and I also think the metal drivers look cool against the black baffle. By far the most striking characteristic of these speakers is the long, recessed slot that runs vertically below the drivers. This is the port, and the shape is said to minimize port noise and grille-loading effects. On the back of the speaker is a lone pair of five-way binding posts. Thiel would rather you spend money on a better run of cable or a better amp rather than doubling up on lesser versions of either. Those posts sport big, meaty lockdown nuts that were an absolute pleasure to use. The spikes are also rather large, which helped when it came time to level the speakers. Thiel offers an optional outrigger base ($200 per pair), which I did not have, that would make the leveling process a little easier while further stabilizing the small towers. Moving on to the parts that move, the Thiel-designed and -manufactured drivers in the CS 1.6 are all new and unique to the CS1.6. Jim Thiel noted that one of the major design goals in undertaking this project was to increase driver output, sensitivity, and dynamic range while also lowering distortion versus the CS1.5. Thus the 6.5" aluminum woofer uses a 3"-diameter voice coil that is purported to increase driver rigidity, raise the breakup frequency up to a more benign 9kHz, and also allow the magnet to be placed inside the coil, making the CS1.6 inherently magnetically shielded. Pretty nifty engineering there. The tweeter is a new 1" aluminum dome that incorporates a longer gap and a copper-stabilized magnet system similar to that in Thiels more upscale drivers. All this attention to drivers is necessary in first-order designs as the slow frequency roll-off means each driver will operate over a relatively large frequency range, thereby demanding robust drive units to avoid distortion. But Thiel also managed to increase the efficiency of the design as well, and sensitivity is up to a stated 90dB from 86dB in the CS1.5, while impedance remains 4 ohms nominal (3 ohms minimum). Rounding out the specs, frequency response is listed as 48Hz-20kHz (-3dB) and recommended power is 50-300 watts. The woofer crosses to the tweeter at 3kHz via a first-order slope that is said to allow the CS1.6es to be phase coherent, and the characteristic backward-sloping front baffle is designed to time-align the drivers so that the sound from each driver reaches the listener simultaneously. Thiel recommends placing the CS1.6es at least three feet from the front wall and five feet from side walls with little or no toe-in. The speakers should also be spaced "farther apart than most" due to their claimed wide dispersion characteristics. Optimally, Thiel recommends an equilateral triangle setup between the speakers and the listener, but one important constraint due to the phase and time alignment of the drivers is that the listener must be at least eight feet from the speakers to derive the full benefit of the design. In my room, the side walls are not a problem, and my preferred setup has the speakers about five feet from the front wall in a seven-foot equilateral-triangle layout. Unfortunately, I found the mids and highs did not come together in this position (which I would have known had I read the manual first), and I found that backing the speakers up a foot maintained adequate separation from the room while allowing the drivers to integrate seamlessly. I tried the speakers pointing straight ahead as recommended, but found I preferred a slight toe-in that yielded more solidified center images. In general, I did not find it hard to place the CS1.6es to get good sound, although the bass did become a little boomy if I encroached on the three-foot distance to the front wall. From an upstream-equipment standpoint, I had another situation altogether. I will say up front that the CS1.6es are very revealing transducers, to the point that I do not think you can simply plop them into any existing system and necessarily expect beautiful music to automatically materialize. For example, my system evolved around my Soliloquy 5.3 speakers with a fairly tame silk-dome tweeter that I find to be more forgiving than most metal tweeters Ive heard. Installing the CS1.6es made it obvious there was a mismatch somewhere, as the treble, although clean, tended to overwhelm the blend of the music. The first thing I did was replace the Acoustic Zen Silver Reference interconnects between my DAC and preamp with the mostly copper Matrix Reference interconnects and, voilà, music. Ive also been playing with a Marsh Sound Designs P2000b preamp and A400s amp (reviews forthcoming) that are, to say the least, impressive and made for an absolutely sublime match with the CS1.6es. The A400s, at 200Wpc, offers double the power of my reference McCormack DNA-0.5 (Rev. A), and the Thiels definitely opened up a bit more and improved dynamically with the more powerful amp despite the Thiels relatively sensitive nature. The Thiels also sounded smoother overall through the Marsh siblings, making everything sound a little more musical and little less analytical. In short, everything just seemed to gel better. Its a synergy thing, and the main point here is that if you really want to catch this fish, you gotta use the right bait. This holds true more for the Thiel CS1.6es than any other speaker Ive had in my room to date. I would have to say the first three things I noticed about the CS1.6es were resolution, resolution, and resolution. These things simply did not miss a trick. If there was a sound to be reproduced, it was reproduced quickly and cleanly (emphasize cleanly) along with everything around it. The speakers made me feel that if I had five-way binding posts connected directly to my brain I wouldnt have heard anything more than I did through these Thiel speakers. The second thing that was readily apparent was that there was no lack of soundstaging ability here. Instead of perceiving a soundstage that has a well-defined front, middle, and back as I find with most speakers, with the Thiels there are a seemingly infinite number of gradations within each of these segments that allow sounds to be placed very precisely. I think it is the combination of the extraordinary resolution and soundstaging ability that lies at the heart of what sets the CS1.6es apart from just about any speaker Ive heard and may have been a big part of what struck me so profoundly when I originally heard the CS1.5s. The result is impressively clear and precise imaging that does not require any thought, imagination, or effort on the part of the listener to figure out whats where. Everything just appears where it is supposed to be from left to right and front to back and, just as important, it intuitively sounds right -- not manufactured. Amplifiers  Marsh Sound Design A400s, McCormack DNA 0.5 (Rev. A). Preamplifiers  Marsh Sound Design P2000b, Rotel RSP980 preamp/processor. Digital  Pioneer DV-C302D DVD player (used as transport), Electronic Visionary Systems Millennium DAC 1. Interconnects  Acoustic Zen Matrix Reference and Silver Reference. Speaker cables  Acoustic Zen Satori shotgun biwire. Digital cable  Apogee Wyde Eye coaxial. So much for the initial impressions and picking the low-hanging fruit -- time to get real and play some music to determine whats really going on here. Given the strengths mentioned above, I immediately went to classical music and brought out William Tell & Other Favorite Overtures [Telarc CD-80116] to see what the CS1.6es could flush out. I like Rossinis war-horse as it runs the gamut from individual solo instruments to a bombastic grand finale, with everything in between -- a veritable obstacle course that the CS1.6es passed with flying colors. Given the speakers' obvious ability to resolve small details, I was not surprised to hear the subtle breaths being expelled into and through the flute during its classic duet with the oboe, but that the tonality of both instruments was so thoroughly portrayed that they made me take notice. Seeing all those metal drivers had me skeptical that fluid tonality could be a strength of the Thiels, but this was a solid step in the right direction. Then the brass kicked up in full dynamic splendor, and along with good tonality there was nary a hint of zippiness that I find can be a problem among more detailed speakers when reproducing massed brass. Placement of instruments and groups of instruments within the stage was exceptional, and reverberations that defined the scope of the venue were fully conveyed and added to the enjoyment of the performance. What truly surprised me was the scale of the presentation, especially as the piece progressed into its final climax. I fully expected to be under-whelmed here given the size of the CS1.6es, but what I heard left me wanting for very little, with the possible exception of maybe a little more image height, and by the end of the piece I actually had goosebumps. This led me to explore the CS1.6es' bass and dynamics a bit further, so I pulled out Steve Coleman and the Five Elements' Def Trance Beat (Modalities of Rhythm) [Novus 63181-2 01241], which has caused more than a few woofers to cry uncle in my room. "Multiplicity of Approaches (The Afrikan Way of Knowing)" is especially torturous as a punchy bass drum combines with a low bass line to create some particularly demanding passages that overpower many speakers even at sub-normal listening levels. But the Thiels never flinched despite my cranking the volume as far as my ears would allow -- truly impressive. And although the bass didnt shake the room as much as that of some larger models can, there was more punch to these little guys than I ever would have guessed. Later in the song there is a fiery drum solo with lots of quick stick work and cymbal splashes, and the CS1.6es were every bit as quick as the drummer and stayed right with it to the end without missing a, um, beat. So in addition to sporting a surprisingly powerful punch, these Thiels could throw some lightening-quick combinations. The cymbals are relentless toward the end of this solo, and although very detailed and extended, the tweeters presented them cleanly and with no hash or distortion whatsoever. It appears both drivers are built to handle stress with finesse. Next I cued up Keb' Mo's Slow Down [OKeh/550 Music BK 69376] to see if Mr. Mos clearly recorded vocals would remain so after being piped through the CS1.6es. "Love in Vain" features just Keb' Mo' on acoustic guitar and vocals, and if something isnt working right it will usually manifest itself on this song in the form of excess sibilance or a lack of clarity. I detected neither through the Thiels, and Mos vocals came through as clean, natural, and downright believable as Ive heard. The guitar also sounded pristine with just the right balance of plucked string and body as to sound utterly real, and all the little nuances that accompanied Mos vocals, playing, and physical movement were there too, but never more than they should have been. It is rare in my experience to find a speaker that can pull off this level of detail yet still remain balanced and true to the performance as well as the recording. Moving on to the more lively "Muddy Water," the CS1.6es valiantly kept up with the driving bass line while clearly depicting and placing each instrument on the three-dimensional stage. The harmonica, cow bell, woodblock, and guitar among others all found their place more distinctly than Ive heard previously, and it was even easy to tell which cymbals were closer than others through the crashes. The only thing I found a little lacking was the tom-tom in "A Letter to Tracy," which, although satisfyingly fleshed out, did not have quite as much impact as Ive felt before. A CD that has been getting a lot of air time of late at the Shea household is the self-titled Cyrus Chestnut [Atlantic 83140-2]. It is a nicely recorded mix of jazz instrumentals along with a couple juicy standards featuring Anita Baker on vocals. On "Summertime," Bakers voice comes through clean and crisp but also full of tone and character, once again belying my initial concern about metal drivers. The piano floated naturally in and around the left corner of the room in perfect scale behind the left speaker, and the light cymbal work, although fully detailed, remained nicely in the background, leaving Ms. Baker alone in the foreground. On "Mothers Blues," the sax was all there and as the piano soared to the upper octaves I detected not a hint of breakup, distortion, or anything other than pure hammer and string. These CS1.6es are as clean as a whistle, man. I realize to this point I have not written much on the CS1.6s faults, and thats because theyre extremely hard to find. Its not that the CS1.6 is a perfect speaker, but I view any of its shortcomings more in terms of its physical limits and its finicky choice of partners than on anything it does to music. This is the most neutral speaker Ive heard and as such it is tough to criticize, but I will discuss areas that may pose challenges in the real world. This is not a speaker that will coddle you in comfy and carefree sonic bliss unless the music is recorded that way and the upstream equipment youre using will pass that through. This CS1.6 is more a speaker that demands your attention, as it is quick to point out everything the musicians and recording engineers wanted you to hear. One reason for this is that the tweeter is very detailed, extended, and clean, and with the wrong electronic partners or poor recordings it will be very easy to dismiss the CS1.6 as too bright (I was initially headed down this path). In addition, those who are used to the more gentle sound of certain silk-dome tweeters may never warm up to an aluminum dome. Size is also an issue, and on larger-scale works I did notice a slight lack of height compared to some physically bigger designs. And although the CS1.6es excelled in handling macrodynamic swings and did a good job bringing performers into the room, those performers could be fully heard but not always fully felt to the degree that I have experienced with some other speakers. Likewise, the CS1.6es will not bounce you from your listening chair with gobs of gut-wrenching bass, but there is enough there that I would consider a subwoofer optional unless youre a bass fiend. I needed to look no further than to my own Soliloquy 5.3s to find a suitable comparison for the Thiels in both size and price. Both speakers will vanish in a room and throw off a very large three-dimensional soundstage, but the similarities pretty much end there. I found the CS1.6es to image better within the stage while resolving more inner detail and generally to be better balanced and more neutral to the source. On the other hand, the 5.3s yield a richer presentation that, although not as detailed as the Thiels, adds a bit more life to the performance while also providing greater weight overall, which let me feel the music more. Although the volume knob on my preamp tells me the CS1.6es are even a little more sensitive than my relatively amp-friendly 5.3s, the Thiels sure seemed to appreciate a beefier amp, which is probably a function of their more challenging impedance characteristics. Id consider the 5.3s the more tube friendly of the duo, but I highly doubt this would be the deciding factor between these two speakers. One appeals more to my right brain while the other more to the left, and if I could, Id live with both depending on the music and my mood. That I was impressed with the Thiel CS1.6 would be an understatement, and for all the performance they deliver, they must be considered a relative bargain at their $2390 asking price. Words like bloom, rich, laid-back, forgiving, and warm do not apply to the CS1.6. But if transparent, accurate, clean, quick, open, and detailed describe characteristics you value in audio reproduction, you too may find yourself readily swallowing the hook for these speakers. Price: $2390 USD per pair.